Here’s a weird one. And not out of keeping with the series, you may say. But what I have in mind this time is the October 19, 1469 union of Ferdinand and Isabella that didn’t create modern Spain. 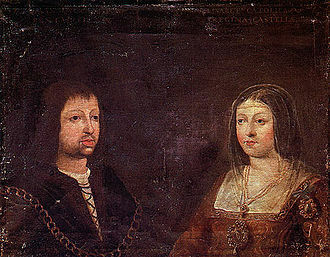 If you’re wondering why it should have been expected to, or thinking a list of historical events that did not create modern Spain would be unreasonably long, I should note there that Ferdinand was heir to the kingdom of Aragon and Isabella to that of Castille; she duly succeeded when her brother died in 1474 and he in 1479. Now Aragon and Castille were not formally merged into a single political unit until Philip V in the very early 18th century, by which time the once-mighty Spanish empire was on the skids and Spain was headed for stagnant irrelevance on the margins of Europe. Which you’re probably wondering how it could happen if there was, as I and the lawyers maintain, no Spain. Except that’s not quite what I said. I said it didn’t create modern Spain. And I say it’s weird because Spain did have protoparliaments at that time, the Cortes. Aragon had one and so did Castille. And you’d think the decentralized structure of the Spanish country-like thing would be ideally suited to their development as effective checks on the power of the monarch. Instead they were basically swept aside. Ferdinand and Isabella decided to limit the power of the bourgeoisie and the nobles so they did, essentially turning the Cortes into rubber stamps except, for a while, on taxes, where they had some capacity to resist. And the result was a Spain that was somehow glittering yet hollow, apparently modern and dynamic yet fundamentally stagnant and ineffective. Rest assured, English monarchs would have loved to break or disperse Parliament. But they never could. It was too deeply embedded in the national, social as well as political fabric. And a major reason why is that it included the common people. But we could get into a kind of logical circle here, asking why in England it was impossible to exclude the common people and getting the answer that they were too firmly included and vice versa. Which takes us back into the “Dark Ages” and the fact that self-government in the Anglosphere has very deep roots in Anglo-Saxon-Jute habits of self-government laid atop the remarkable and in many ways unique culture of Roman Britain. It also reminds us that self-government is not easy or natural. In retrospect historians can easily explain the growing power of the English parliament as natural given the rise of the bourgeoisie or some such. They can also easily explain the shrinking power of European parliaments as natural given the rise of the national state or some such. What calls out for explanation, and appreciation, is the two processes running parallel but in opposite directions on the continent and in the UK.